Juniper & Spice | Cooking and food and stuff. I really wanted to get Hermit some sort of dark chocolate with Whisky (preferably the Islay Scotch Whisky if I could) for Valentine’s Day. The pickings were slim (and expensive!). So I went to the trusty Google and found a couple recipes I used as inspiration. Very happy I was able to make a delicious, yet dairy-free (and subsequently, vegan) chocolate truffle! The flavor of the almond butter is not noticeable in the final product as the consistency is very similar to a ganache (chocolate + heavy cream), which is the traditional filling for a truffle. Just a splash of non-dairy milk/creamer helps bring it together. Due to the dairy intolerance, I used a dark chocolate – which Hermit really likes anyway, so it was a win. I imagine a milk chocolate (or maybe even white chocolate) might be good as well! Makes about two dozen truffles. Beat in the nut butter with an electric mixer until smooth. Gradually add the scotch, milk, and espresso powder (if using) and mix well. Refrigerate the dough (in the bowl you mixed it in) for 1-2 hours, or until firm enough to make balls. Once the dough is set, using either a spoon and your hands, or a 2-tsp. cookie scoop, or a melon baller, create ~1-inch balls. Place on wax paper on a cookie sheet in the freezer for 5-10 minutes. If covering in chocolate, chop the remaining 6 oz. of chocolate and melt. I don’t believe I tempered the chocolate correctly but I don’t really care either. 🙂 It should be about 89-90º and not much higher. Tempering will make the chocolate coating shiny and have a ‘snapping’ quality like with professional chocolates. Remove the truffle balls from the freezer. One at a time, place the ball in the melted chocolate. Using a fork, gently lift the truffle out, hitting the side of the bowl with the fork slightly to remove excess chocolate. Place chocolate-covered truffles on wax paper on a cookie sheet. If desired, top with chocolate sprinkles or other garnish. Or, roll the truffle balls in cocoa powder or chocolate sprinkles or almonds or whatever takes your fancy. Using this method, you may not want to freeze the truffles as the dry coatings will stick better if the truffles are a bit warmer. Once set, place the finished truffles, on the wax paper, in the fridge to harden. If you didn’t temper your chocolate, you’ll want to store these in the fridge until serving. Remove any excess chocolate from the bottom of the truffles with a small paring knife. If desired, serve in small candy cups/mini muffin liners. What can I say? Sometimes you can’t beat a classic. I tend to create smaller-than-teaspoon sized balls for my cookies as I like knowing I can have just one (or two or three…) and not feel super guilty. Adapted from Betty Crocker. Yields about 4 – 6 dozen, depending on cookie size. Line a baking sheet with parchment paper or lightly grease. Place a baking rack in the middle of the oven and preheat to 375°. In the bowl of a stand mixer, beat brown sugar, butter, molasses, and egg, until well combined. Mix in flour, baking soda, spices, and salt until incorporated. Roll dough in teaspoon-sized balls (or smaller, if you want mini cookies). Roll the balls in granulated sugar and place on the prepared baking sheet, about 2-3 inches apart (depending on the size of your cookie balls). Bake for 8-12 minutes (less time for smaller and/or softer cookies and more for larger and/or chewier cookies), until just set in the middle. Immediately remove from baking sheet to cooling rack. I love tea. Tea, tea, tea. Here it goes down, down into my belly… Oh wait, that’s Scotch. As a kid, I hated most tea. Unless it had a ton of sugar in it. Now, I love how versatile and healthy and tasty different types of tea are. Next to water, tea is the most common beverage we drink in this house during the winter. I have a bad habit of buying miscellaneous tea when I go to the grocery store. When Hermit is along, this happens much less frequently ;). One of the best things about tea? It naturally has no calories! It’s a great addition to any diet. It’s warming, it’s filling and there are numerous health benefits, especially some of the more medicinal/herbal teas on the market. And, if you’re ALWAYS cold like I am, a nice steaming mug of (zero calorie) tea is a blessing in the winter months. In the summer, I almost always have iced tea in the fridge, ready for a refreshing treat. For a while, I’ve had about 3 pretty consistent favorite types of tea. And I can’t rank them in order of favorites because they each serve their purpose. I would highly recommend all of the following tea. 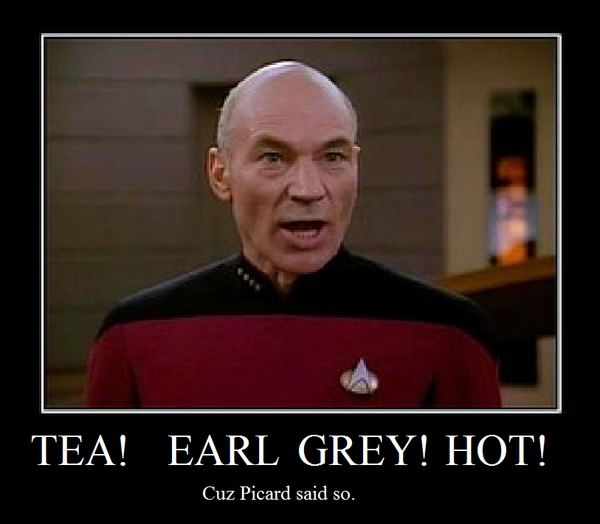 Twinings Earl Grey: Favorite black/caffeinated tea. This has just a very subtle fruity/citrusy note running through it sot it’s not quite as bitter as a lot of straight-up black teas. Celestial Seasonings Honey Vanilla Chamomile: This has become my favorite go-to herbal/non-caffeine/relaxing tea. There are just subtle notes of honey and vanilla in this tea – it doesn’t taste at all like your traditional Chamomile (which I do not like much). Bigelow Green Tea with Jasmine: Hermit and I frequent Asian restaurants a lot. A lot. So we’ve been a fan of Jasmine tea for a long time. This brand is one we both love, hands down. It’s quite comparable to loose-leaf green jasmine tea. Tazo Passion Tea: I only like this when it’s brewed double-strength, and served over ice with a little extra water. This is how Starbuck’s serves it and it’s such a great summer treat. It is summer again yet? Tazo Awake Tea: Again, like the Passion tea, I love this iced. Brewed hot is too bitter for my tastes, but something about the iced version is super tasty. Of course, I have to give a shout out to Starbuck’s Chai Latte as well. I have one of these every. single. afternoon. I know. A short is only 120 calories (with 2% milk) though so it’s a great filling afternoon snack. The extra fat in 1- or 2-% milk gives it more staying power than a nonfat drink would have. That’s a discussion for another time, though… I bet you didn’t even know they have a short. That’s an 8-ounce beverage. You know, what a ‘Small’ used to be before a 21-ounce beverage was considered small. What are your favorite tea(s)? Do you need a ton of sugar or straight-up, strong black tea? Do you *gasp* not like tea? In case it’s not obvious, I love mini treats. I love being able to eat something and barely feel the guilt as it passes my lips. These scones are just mildly sweet – a little hot spot of warm gooey chocolate in a flaky delicious dough. One of my top 3 favorite desserts. And they can be eaten as breakfast, so even better! I could make these scones every single day and eat them all. And they disappear so easily… I don’t know HOW that happens. Maybe we have scone-stealing house elves. Fortunately, this recipe makes just 12 2-bite scones. Perfect for 2 or 3 people. Or 1 person over 2 days. Or 1 person and 2 house elves. Whatever works for you. These are a delicate confection with a soft-crisp exterior. Very similar to handmade biscuits – the small pieces of cold butter are what create the flaky, air-pockety qualities in scones. Much like in croissants, I imagine. Whereas, in cookies, the butter is softened before being added and creates a different texture entirely. And the best thing, if you want to make these for a crowd, the recipe easily doubles or triples. Work people devoured these when I tripled the recipe one morning. I want to try making them dairy free (for Hermit) although I don’t have much experience baking with margarine vs. butter. 1. Place rack in middle and preheat oven to 375°; grease a small/medium baking sheet or line with parchment paper. 2. In a medium bowl, whisk together the flour, 2 tbsp. sugar, baking powder, and salt. 3. Using a pastry blender, two butter knives, or your fingertips, cut the butter cubes into the dry ingredients until the butter pieces are no bigger than peas. 5. With a fork, mix half-and-half and egg yolk into mixture until just combined. 6. Turn out dough onto a floured surface and knead 5-6 times, just until a ball has formed. Be careful not to over-mix or over-knead. 7. Using a sharp knife or a dough cutter/lifter, cut the dough in half. Lightly flour your hands and gently pat each ball into a disc about 1/2-inch in height. Cut each disc in half and then each half into thirds. You’ll have 6 roughly-equal wedges/scones from each disc. 8. Carefully transfer the scones to prepared baking sheet, spacing equally apart; at least 1-inch between scones. 9. Bake in preheated oven for 13 – 14 minutes, or until the bottoms are golden and the tops have just barely started to become golden. 10. Remove scones to a cooling rack. Let cool 5 minutes and enjoy immediately – be careful, the chocolate is piping hot. Best served fresh. 11. To serve again (warm), pre-heat oven to 350°, wrap the scones loosely in aluminum foil and heat on a baking sheet for about 5 minutes. The outside should crisp up and taste almost as good as the first day. A few weeks ago, Hermit and I tried some (French) macarons from a local bakery. I had a Groupon ($5 for 10, sweet). They weren’t very good, which is sad for a bakery that only does cupcakes and macarons. Yech! Anyway… I figured maybe it was just that bakery; I’ve read so many good things about how good macarons are. I figured, why not try baking some for myself? What could it hurt? I am so glad I didn’t give up on macarons! When made correctly (?) (tastily? fresh?) they’re delicious. The recipe I borrowed was paired with a lemon-ginger type buttercream. Which, while this sounded fantastic, I wanted to try a zingier lemon. So I made this lemon curd recipe. Why lemon curd? I have no idea. I can’t even recall ever eating lemon curd on it’s own, didn’t really know what it looked like, or how it tasted. Oh, it’s a zingy, sweet, thick mass of deliciousness. The macarons with lemon curd were a little unstable right away. After setting them up, I let them rest in the fridge overnight and the curd became thicker and held the cookies together nicely. Then I made these cupcakes and had some Rum Buttercream frosting left over. So I put frosting on part of the macarons and lemon curd on the rest. They were both great – each in their own way. The rum buttercream is made with meringue and egg nog and reduced rum, so it pairs nicely with the gingerbread macarons. But the flavors are also very similar. Macarons are the bane of many bakers’ existence – they can be super finicky and impossible to master. Half of mine didn’t rise appropriately, didn’t get the characteristic ‘feet’ on the bottom, and cracked somewhat on top. Meh, they still tasted fantastic. If you don’t own a kitchen scale, invest in one. You can get a decent scale for $20 or so. It’s worth it in this recipe because you want your measurements to be exact with macarons. I”m looking at some blueberry macarons next… we’ll see. I just found freeze-dried blueberries (no sugar added) at Trader Joes. * The egg whites need to lose a little moisture so they’ll bake properly. At least the night before, or up to 5 days before you make macarons, put the egg whites in a bowl in the fridge (outside of the shell), with a loose paper towel on top. You can also leave them out on the counter overnight with a paper towel covering, to help them age quicker. ** Almond meal is expensive. I used natural/raw almonds (I like these because they don’t process peanuts or other tree nuts in their factory, which is important for family allergy reasons. And they’re reasonably priced – Target frequently has 16-oz. bags on sale). Put the almonds in a wide bowl, pour boiling water to cover the top of the almonds, and let sit for 1 – 2 minutes. Drain the water and rinse briefly in cold water. Pour out onto a towel on a baking sheet and partially dry. The skins should slide off with a little pressure. 1. Line 2 baking sheets with parchment paper and set aside. 2. Mix together powdered sugar, almond meal, and spices. Whisk well and then sift together. The almond pieces may be bigger than than the holes in the sieve so you’ll have to whisk again after sifting. 3. Prepare the bowl and whisk attachment of a stand mixer by wiping each with a little lemon juice or white vinegar. If there’s any leftover oil from your hands or something else you made in there before, the egg whites won’t form the peaks like you need. 4. Combine the aged egg whites and granulated sugar in the prepared bowl. Beat on medium until you have a thick, glossy meringue (think: shaving cream-ish). 5. Remove the bowl from the mixer. Add the almond mixture to the bowl and carefully fold into the meringue. Make sure to count your folds and do not do more than 45 or 50. I’m usually around 40 – at about this point, drop a little on the prepared baking sheet – if the top folds over on itself, the batter is ready to pipe. 6. Fill a pastry bag, fitted with a large round tip, or a gallon ziploc bag (cut the corner off after filling) with the dough. It’s going to leak out of the end when you’re filling. Remedy this by either holding the bag closed with a hair pin just above the tip, or use some other device. 7. Holding the pasty bag completely vertical, pipe 1 1/2″ circles on the baking sheet, about 1 1/2″ apart. Set the baking sheet aside for about 45 minutes, to allow the macarons to form a skin on top of the cookies. (I wait 15 minutes before piping the macarons onto the second sheet, as it will sit on the counter an extra 15 minutes while the first batch bakes). 8. Bake in a 280° oven for 14 – 16 minutes. If you’ve done everything ‘right’, the cookies should get ‘feet’ about 6-8 minutes into the baking. This is the little, rough-looking layer at the bottom of the cookie – mine aren’t perfect but they still taste wonderful. The cookies are done when the tops are dry to the touch and can be removed from the baking sheet with just slight pressure. (Pick an ‘ugly’ macaron to test this out on, in case it’s not done, you’ll destroy the cookie – better to ruin an ugly one). 9. Remove the cookie tray to a cooling rack. Let the macarons cool completely on the baking sheet. 10. Once cool, ‘pair up’ cookies with similar sized cookies. Flip over one of each pair, and pipe your choice of filling, below, on the upside-down half. Carefully pair up the halves – they can easily crack if you press down with too much pressure. 1. Add the spiced rum to a small saucepan. Heat until boiling over high heat. BE CAREFUL and watch closely – rum is very flamable. You might accidentally set the rum on fire (flambé) – carefully remove the pan from heat and put the lid over the top for a few seconds. Once extinguished, return to the stove top. Cook until you have 3-4 tbsp. of liquid. Cool completely. 2. Here you have to be coordinated – it helps to have your mixer near your stove, if possible. In a medium saucepan, combine the sugar, water, and corn syrup. Attach a candy thermometer to the side of the pan. Over high heat, boil the mixture until it hits ‘soft ball’ stage, or 235 – 240°. 4. With the mixer on high speed, carefully, slowly, pour the sugar mixture into the mixer bowl. Try and hit the very edge of the egg whites with the stream of sugar without hitting the beater. Whip on high speed until the mixture is room temperature and you have stiff peaks. Wrapping your mixer bowl with ice packs will speed up this process. 1. Put the lemon peel and sugar in the bowl of a food processor. Pulse until you have a fine zest incorporated into the sugar. 2. In the bowl of a food processor, cream the butter with the lemon sugar mixture. Once combined, add the eggs one at a time. Once incorporated, add the lemon juice and salt and process until smooth. 3. Pour the mixture into a 2 quart saucepan and heat over low heat until thickened, about 10 minutes, stirring constantly. If you have a candy thermometer, the mixture will be just around 170° when it thickens. Remove from the heat and cool or refrigerate. There’s something so silky and smooth about white chocolate. That’s because it’s made of cocoa butter rather than the cocoa beans of darker chocolate. It forms a perfect base for milk and heat. Vanilla, buttery, rich. A wonderful platform for a dollop of whipped cream – or the canned stuff that masquerades as whipped cream :). I love the white hot chocolate at Starbucks but don’t often order it. I’m a slave to chai lattes. The white hot chocolate can be very rich. 1. Add the chocolate and half-and-half to a medium saucepan. Heat over medium heat, stirring constantly, until the chips have melted completely. 2. Stir in the milk and vanilla extract, heat until warm, stirring occasionally. Watch carefully – milk can easily go from simmering to boiling over. 3. Divide among glasses. If desired, add a dollop of whipped cream to each.